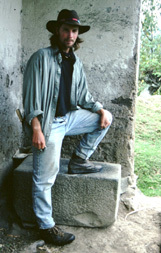 This is a picture of me at a pre-Inca site near Sigsig, Ecuador, known as “Castillo de Duma” or “Ingapirca de Chobshi”. It is a walled enclosure of unknown date or cultural affiliation unlike the type of structures the Incas built in the region. I am an anthropologist specializing in the archaeology of the New World. My primary research is concentrated in Andean South America, where I do field work mainly in Ecuador, but also in Peru. I have also done archaeology in parts of North America, including Texas, the Southwest, and California; I expect to also do some research in North Carolina in coming years. My main interest is understanding the processes of expansion and maintenance of the Inca Empire and other conquest states in the New World. In my research, I combine advanced scientific techniques (geochemical sourcing and GIS) with analysis of historical materials (ethnohistory). The Saraguro region in the southern highlands of Ecuador has been the subject of my PhD dissertation and a number of subsequent projects. 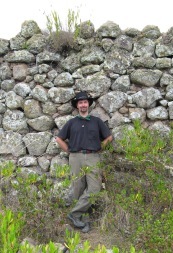 Other places where I have conducted research or collaborated with other archaeologists include the Cuenca region of southern Ecuador, the Pambamarca area of northern Ecuador, and the Nasca and Cuzco regions in Peru. I expect to be doing research in a number of other regions in future projects. –> Below are links for downloading a PDF version of my dissertation and other works. I will post other publications as I determine if I have proper rights for distribution. 2004 Archeological Papers of the AAA, Vol. 14 Dynamic Display, Propaganda, and the Reinforcement of Provincial Power in the Inca Empire *this takes you to Anthrosource where you can download the pdf if you or your institution have a subscription – if not, please e-mail me. An old picture of me posing with one of the hundreds of building stones the Incas made people carry from Cuzco, Peru to Ecuador. 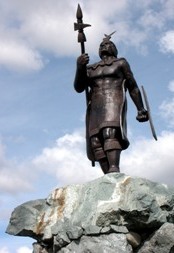 Statue of the Inca Emperor Huayna Capac in Cuenca, Ecuador.